Melva Mae Hugley Hampton was born on August 22, 1919 to Harvey and Maude Hugley in Almena, Kansas. 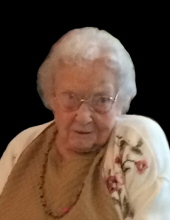 She departed this life on January 28, 2019 at her home in Adair, Oklahoma. Melva grew up in Kansas and moved to Adair when she was fifteen. In 1942, she married Cletus Dale Hampton, who preceded in her death in 1985. She was a wonderful wife and homemaker. Melva was a hard worker and sold limousine cattle most of her life. She was a member of the Adair First United Methodist Church. Melva was always serving others; she was a very kind and loving lady. She will be deeply missed by all who loved her. She is survived by her brother, Gerald Hugley, four nieces and two nephews. She is preceded in death by her parents, her husband Cletus and one brother, Dale. To send flowers or a remembrance gift to the family of Melva Mae (Hugley) Hampton, please visit our Tribute Store. "Email Address" would like to share the life celebration of Melva Mae (Hugley) Hampton. Click on the "link" to go to share a favorite memory or leave a condolence message for the family.